Step One helps you learn the skills you need to get back in the employment game. From resume writing to interview skills, we help you land the job. You will partner with an employment counselor, working alongside our employers to help find the best job for you. Twice a month, we offer a FREE weeklong, Employment Training Workshop for anyone between the ages of 18 and 60 that is ready to start working. 1. Show up Monday at 8:45 a.m. and stay until 4 p.m. each day of the week. 3. Finish the week with a mock interview on Friday. 4. Work with your employment counselor to get a job. Join us for ENER-G to stay motivated in your job search. 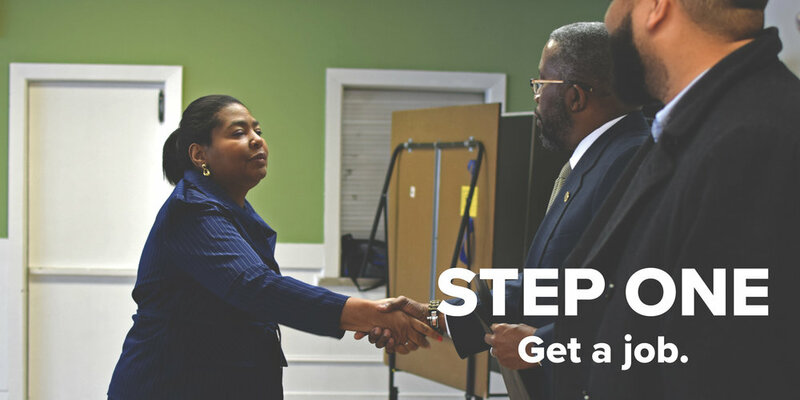 After you land the job, StepUp Connect will help you continue to learn the skills you need to be successful. In Step Two, adults learn more about budgeting, personal and relationship development, goal setting, and more. There is a community of support, including staff, volunteers, and other participants that inspires lasting change with the goal of long term stability. 1. Show up every Tuesday night from 5:45 until 8:15 p.m. for one year. 2. Eat dinner and fellowship with other StepUp participants, staff, and volunteers. 4. Take classes in budgeting, managing emotions, goal setting, conflict resolution. 5. Work with your staff case manager and co-partner, who serves as a mentor. 6. Celebrate your success at graduation! 1. Eat dinner and fellowship with other StepUp children, staff, and volunteers. 2. Play games and do fun, structured activities. 3. Get homework help, gain exposure to the arts and etiquette, and more! 4. Learn the same life skills as you, on age-appropriate levels. 5. Celebrate their success at graduation! 1. Show up on Tuesday nights from 5:45-8:15. 2. Build community over dinner. 3. Participate in an opening activity. 4. Set goals and work toward achieving them. 5. Learn in interactive and practical ways how to be a successful young adult. Step Three provides continued support in our network. As you improve communication skills and develop your career, we want you to be an ambassador. Tell others about your experience with us and help us recruit new participants. Our Alumni Program seeks to maintain a relationship with StepUp Alumni to offer continued support. 1. Show up on Thursday nights from 5:45 until 8:15 p.m. Bring your child(ren) with you for their own separate programming. 2. Eat dinner and fellowship with other StepUp alumni, staff, and volunteers. 3. Improve communication, leadership, and public speaking skills through membership in Toastmasters International. 4. Enhance and develop your career through free Wake Tech courses. 5. As an ambassador, mentor new alumni, share your experience, and help recruit new participants. 6. Stay connected to the StepUp network with ongoing opportunity and resources for building your career.